One competition - three independent contests - from September through May. For 28 years, the MIT $100K Entrepreneurship Competition has been bringing together students and researchers from across MIT and Greater Boston to launch their talent, ideas, and technology into leading companies. The competition is run as a series of distinct, increasingly intensive contests: Pitch, Accelerate, and Launch. Each contest focuses on developing specific founding skills, and for each semi-finalist contender the MIT $100K brings together a network of resources, including mentorship from venture capitalists, serial entrepreneurs, corporate executives, and attorneys; media exposure; prototyping funds; business plan feedback; and discounted services. Additionally, more than $300K in non-dilutive awards help these new ventures accelerate. 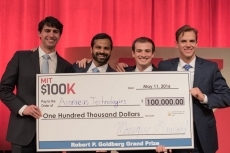 MIT $100K Entrepreneurship Competition is composed of three competitions: Pitch, Accelerate, and Launch, and the structure is designed so that a student who comes up with a brilliant idea at the beginning of the academic semester can participate in the three competitions to develop his or her idea into a viable business plan throughout the year. Pitch is the first contest of the MIT $100K. Are you considering a business idea but haven't yet developed the details? Practice articulating a 90-second pitch in front of a panel of experienced judges, get feedback on your idea and presentation from both judges and mentors, and compete for both the $3K Grand Prize and the $2K Audience Choice Award. Accelerate is the second contest of the MIT $100K. The purpose is prototyping. Semi-finalists will have a small budget, access to industry experts, and a dedicated month to test the idea's manifestation into a product or service. They then present their prototypes behind closed doors. Ten outstanding finalists compete live for a $10K Grand Prize and a $3K Audience Choice Award. Launch is the final contest in the $100K cycle. Semi-finalists are expected to present not just prototypes but full business plans, and they receive funding and elite mentorship along the way. Finalists present onstage to a 1,200+ live audience from Cambridge, Boston, and beyond. Companies worth more than $16B in market capitalization have walked the stage before them. The Grand Prize? $100,000.